But then he issued a warning of his own. Alexis Ohanian, a Reddit co-founder, just owned Elon Musk. 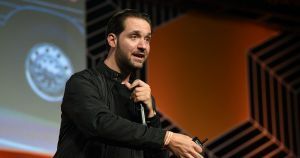 Speaking at the Business Insider Ignition conference on Monday, Ohanian said that Musk’s dire warnings about the future of artificial intelligence are ridiculous, CNET reports. “Elon is writing a great screenplay for a Black Mirror episode,” Ohanian said at the event, implying that Musk’s visions of evil, Roko-style AI overlords and murderous robots belong in the realm of science fiction. But then, before the dust from his atomic takedown even began to settle, Ohanian turned around and issued an AI warning of his own. Rather than killer robots and futuristic dystopia, Ohanian wants people to deal with present day AI challenges, like mass surveillance through facial recognition software or China’s controversial social credit system. That’s very different from Elon Musk’s fear of AI’s dark, far-off future — Ohanian says we should instead be afraid of AI’s dark near future. “The technology is actually here,” he said at the event, conveying the same dire urgency as the Musk warnings that he had just mocked.